“Vertical farming isn’t futuristic; it’s already here,” says vertical farming visionary, Dr. Dickson Despommier. “In 2004 we put the idea on the internet and only got three hits on Google.” Eight years later that same search query on Google now yields 29,800,000 hits. Although recently retired from Columbia University’s Mailman School of Public Health, Dr. Despommier shows no signs of slowing down. He continues to spread awareness to universities, municipalities, architects and agricultural specialists on the importance of ecological principles in vertical farming design and introduce his sustainable vision for our future cities. I recently sat down with Dr. Despommier to discuss his vision for vertical farms, whether certain locales are better suited for farms of this type, his studies on the correlation between unsustainable cultivation and rapid deforestation, and more. Do you think certain cities or global regions are more accessible to vertical farming? What is the economic viability in these regions? I certainly do and I can list them for you. In 2010 I wrote this book and there were no vertical farms. Today there are 50 in Japan alone. These are called plant factories and they are multi-story buildings and warehouses run by a company called NuVege. Half of NuVege’s farms use LED lights and they’re totally enclosed, while the other half use transparent buildings (greenhouses) and they all grow leafy greens. The Japanese trust the plants that come out of these factories because they know they are not contaminated with Cesium which came out of the Fukushima meltdown. It’s all hydroponic. They predict that over a period of 10 years the amount of investment in these farms will double from seventy million to seventy billion in Yen. Another example is the abandoned meat smoking plant that went broke in Chicago but left the warehouse completely intact. The mayor offered it as an NGO activity to anybody who could come up with a good reuse of the space and John Edel made a vertical farm out of it. He has an ecological diagram for the way the building works. So he’s created an industrial ecology indoors using grow lights, his electrical bills are profitable and he’s building a biogas facility which will take all the organic material from around the neighborhood and process it. At that point he’ll be off the grid and his electric bill will be zero! If you had to pick only one aspect of vertical farming to champion, which would it be? Reforestation. It takes fifty years for a forest to fully mature to the point where its starts giving off more carbon dioxide than it takes in. The checker of the treasury conducted a study in 2003 or 2004 to estimate how much money the earth would have to spend over the next twenty years to react to the climate changes. It’s almost a hundred trillion dollars. What if you could save half of that? There needs to be a reliable income-based farming occupation that’s related to carbon sequestration. I want to be a farmer where I watch my profit margin increase every year by the weight of the trees as estimated by the circumference. You can take an estimate of how much carbon was sequestered that year by taking the average of 1,000 trees in a 20-acre area and measuring the diameter of those trees at the end of the growing season. Then you compute your carbon budget for that year and apply to the government based on how much was sequestered. We did a rough calculation for Ohio, Indiana, Oklahoma and Iowa and in just those four states, if you could reforest them completely, you would absorb 4% of the world’s carbon dioxide. 4% of 360 parts per million is a lot of carbon. It would reverse the global climate change. When you couch it in these terms everyone would want to do this, right? But there are politics involved in this. In a blog post on Grist.org, Adam Stein states: “Vertical farms are the corn ethanol of food politics. They seem like a quick fix that will only make the problem worse.” What are your thoughts on this? No! First of all, this is not a quick fix. What he’s neglecting to mention is that for every acre of indoor farming you generate 10 outdoor acres. Tell me how much 10 outdoor acres is worth for carbon sequestration. I want a dollar figure on that. My response is this- it’s not a quick fix because it’s still in development. The economic models have to develop first. In order for those to develop people have to take risks. So the big risks are taken by Japan and Korea, who both have good reasons to because of the nuclear meltdown and having only 36% arable lands. If you don’t believe in the process of industrial evolution then Stein is right, it’s a stupid idea and it’s carbon senseless and it doesn’t make economic sense. But if you’re living in Iceland this isn’t an argument. So one must think in terms of context. I can find geothermal energy in Italy, Iceland, New Zealand and Southern California. 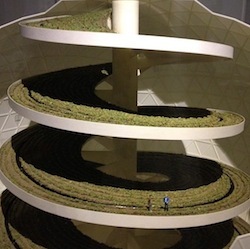 In these contexts vertical farming is not only viable, but invaluable. How do you respond to the critics of your views on vertical farming? In 2010 I wrote a book called The Vertical Farm and it was well received by the professional reviewing press but it got mixed reviews on Amazon. The Guardian wrote a great review of the idea about three years ago and then two years ago they wrote another review and they just trashed the whole idea. They said “there‘s too much energy needed to grow these crops indoors. It’s just crazy.” But then look at the vertical farm established in Singapore. They’ve created a continuous rolling device that catches rain water which gets stored on the roof. This water gets filtered down into the building and dripped into a system that turns a wheel chain, which in turn rotates the crops. They are using the water as a mechanical device to rotate their crops so that the plants are always exposed to the same amount of sun during the day. We’re already doing a lot of indoor farming to commercial levels indoors. That allows you to grow your food and repair your environment.